I've gotten behind in showing you my thrift store finds, but be assured, the Value Village near Bloor and Lansdowne remains a favourite shopping destination! Here are some of the goodies I've found this winter. 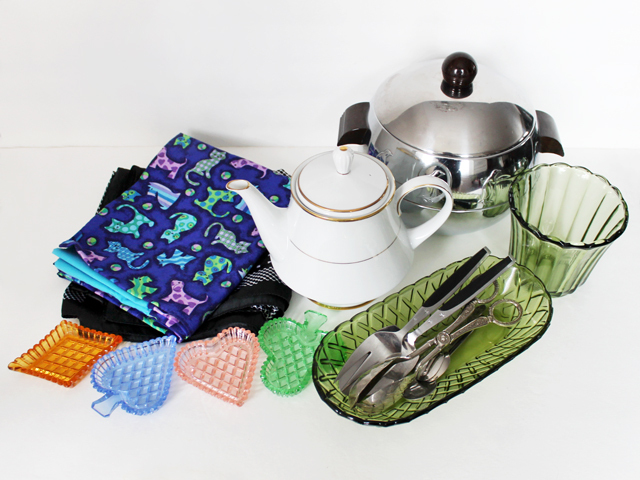 As usual, my most loved sections of the store are the housewares and linens. 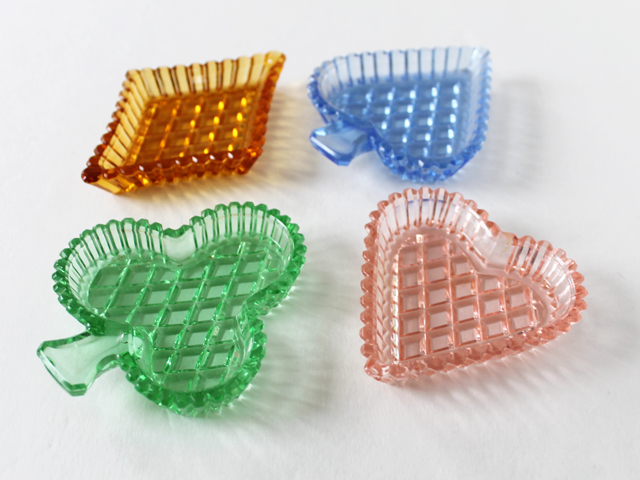 ↑ The oblong pressed glass "basket" might look familiar, because I found one just like it in an amber colour (included in this post) written back in May. I've since discovered that the maker of these is the American company, founded in 1896, called the Indiana Glass Company. 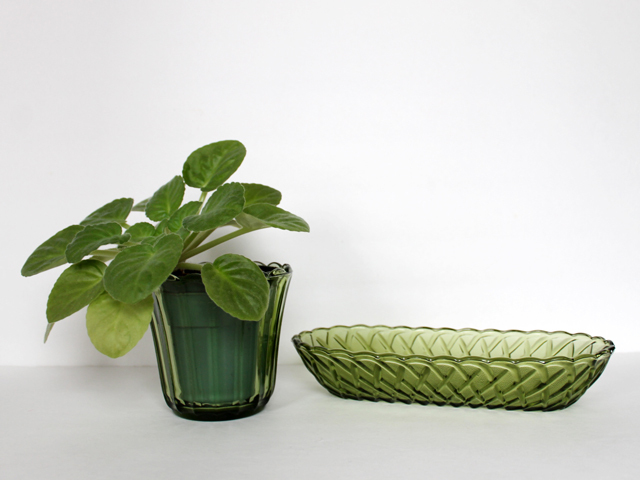 This pattern is called "Pretzel" and it is actually a celery dish. So, it seems, people used to serve stalks of celery on their table in a dish designed especially for that purpose! 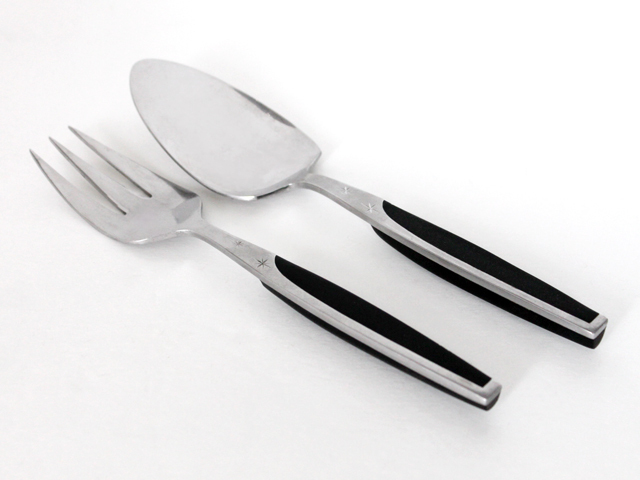 I, on the other hand, have been using it to corral cutlery on a buffet table. While the plant pot appears to be made by the same company, I can't say for sure that it was. 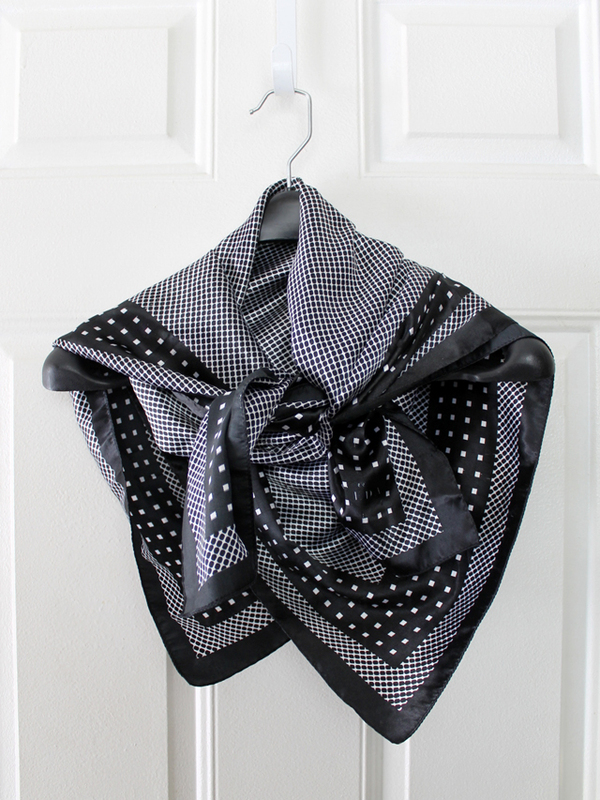 Regardless, it's a cheerful looking little scalloped number that is right at home at our place. 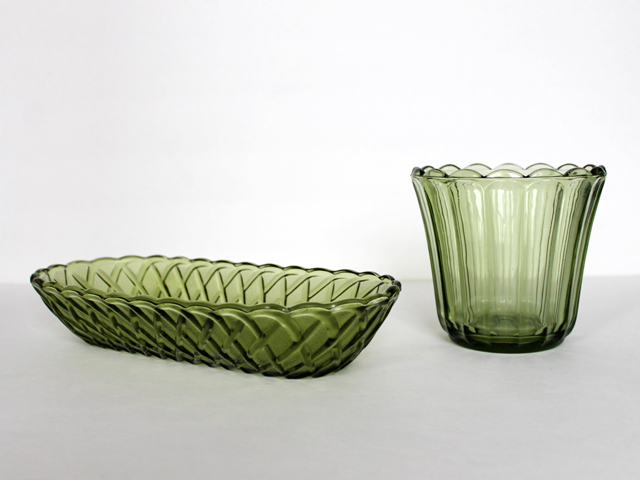 ↑ This next item, a set of cut glass is a foursome of small ashtrays, was made in what was then Czechoslovakia, in the 50s/60s. I found them in that area of the store where they have plastic bags filled with miscellaneous items, like grab-bags. You can't open to examine the goods in detail, and you must take the whole bag or nothing. Anyway, I immediately recognized what these were, as I have a similar set in fish shapes, that I got from ebay a few years ago. 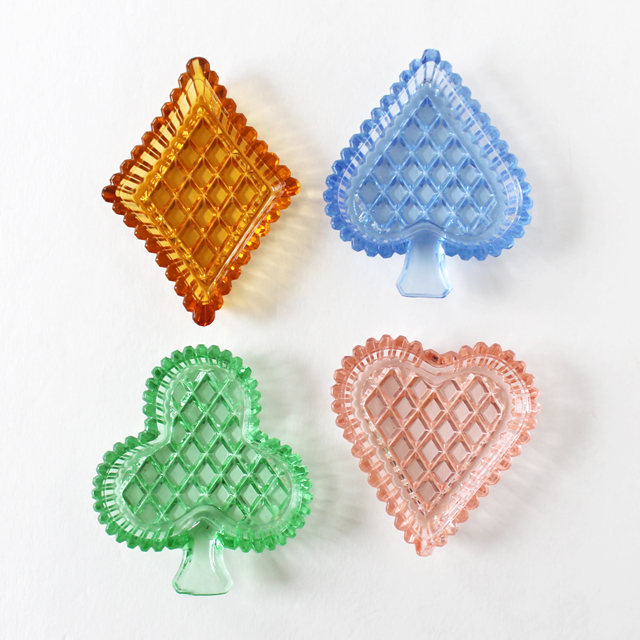 We don't smoke cigarettes, so use these small dishes as jewellery catchers or spoon rests. Sets of tiny ashtrays like these were common in the mid-century, the idea being that each guest would have their own private ashtray, that they could hold nearby at a party, or have at their side around a game table. These card suit ones were especially useful at a ladies' bridge game. There is a set like this one on ebay right now, that's going for $77, including postage. Of course, the monetary value of vintage items is based on what someone is willing to pay for them, so I'm not saying these are worth that much, however, I'd say the $3.99 I paid made these a good find! ↑ Also found in the "grab-bag" section of the store were these serving utensils. ↑ I especially love these stainless steel and wood pieces, decorated with the atomic star motif that is characteristic to the 50s design. They are "Marcrest Ebony Elegance Starburst" pieces and are nice and heavy and feel so good in the hand. 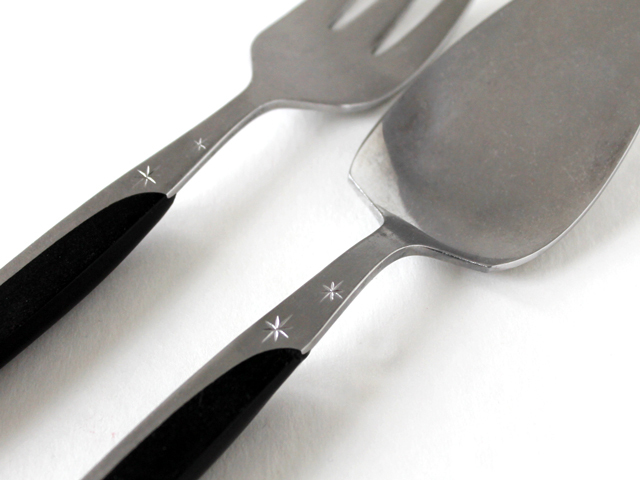 ↑ These silver-plated tongs are not so much my style, but they came in the same bag as the items above. 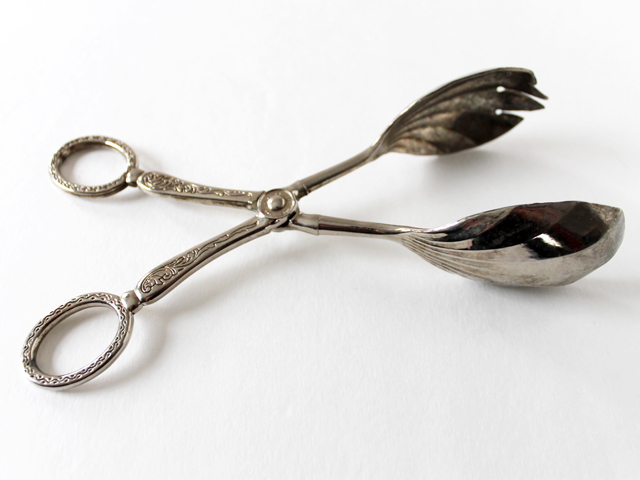 I'll keep them because they'll make a very handy serving tool for salad at a buffet table. 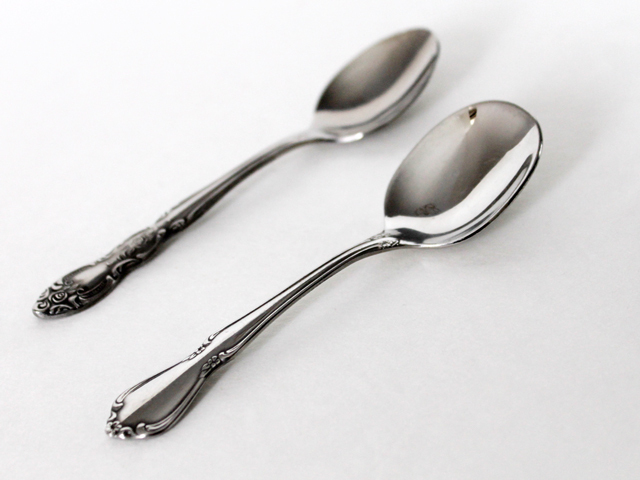 ↑ These small spoons were found in a second grab bag, along with some other spoons that were nothing special. 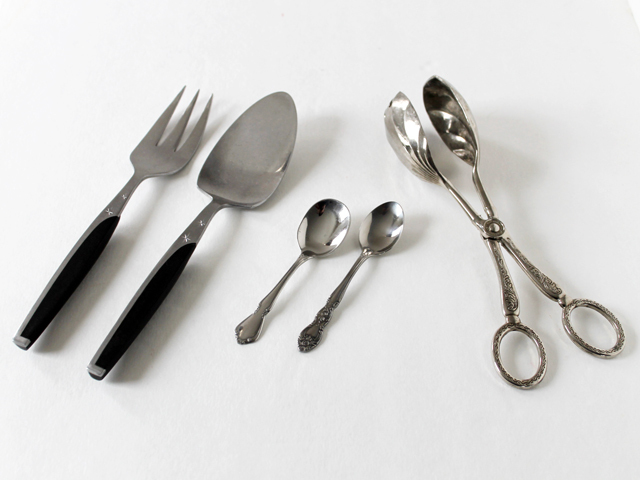 The "target" in that lot was the spoon in the front, made in the 50s/60s by Oneidacraft. It's a spoon specifically designed for a child - called an "infant spoon" - and originally would have come with a matching fork. The pattern is called "Chateau". We use these types of small spoons often, serving sauces and such. ↑ I spotted this next item on a bottom shelf amoungst some ratty looking cooking pots and pans, but knew what it was immediately, and may have run a step or two to get to it. 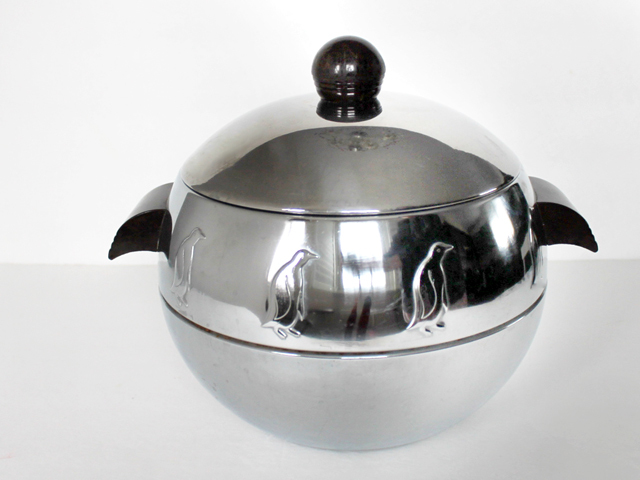 It's the "West Bend Hot Cold Penguin Server", introduced by the American company in 1950s. 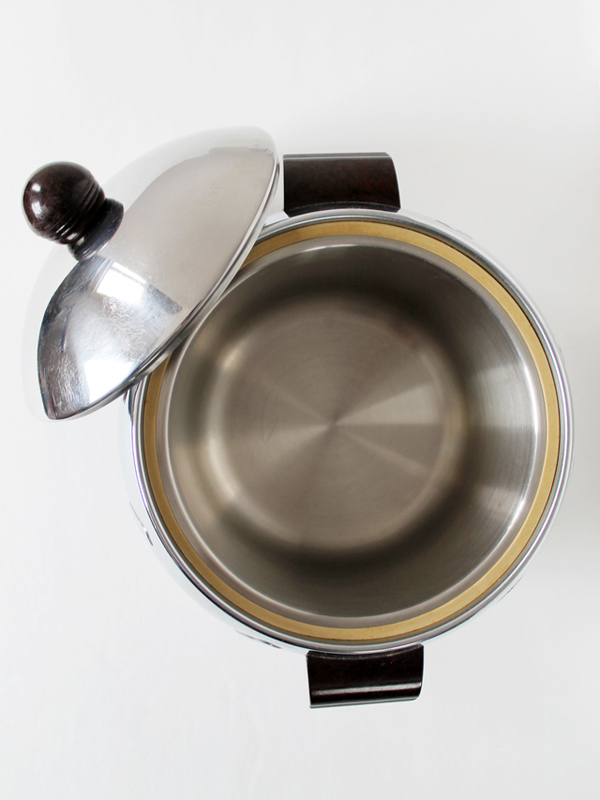 While this chrome with a stainless-steel interior item makes an excellent ice-bucket (what we'll be using it for) it can also be used to serve hot foods, keeping them warm for hours, within its insulated walls. I've been looking at these on ebay but have resisted due mostly to the hefty shipping costs of a relatively large item, so was quite thrilled to find it, in perfect condition, just sitting there at the thrift shop. It was $5.99. I mentioned in this post, almost a year ago, that I'd found a nice teapot to replace our chipped one, but that the new one seemed to good to use everyday. I said then that I'd be putting that one aside to use for company and keep looking for our less-precious everyday pot. 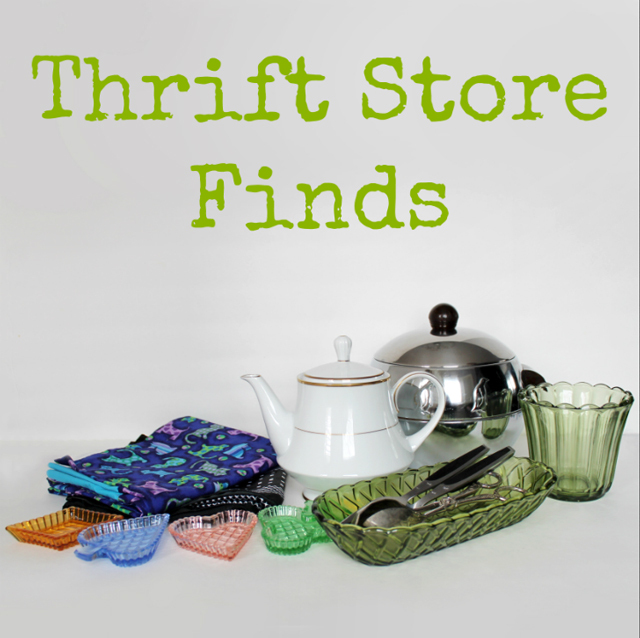 Well, it's been a year, and damn if the only desirable teapots I've found at the thrift store haven't been high quality, valuable ones, that seem too precious for my purpose! 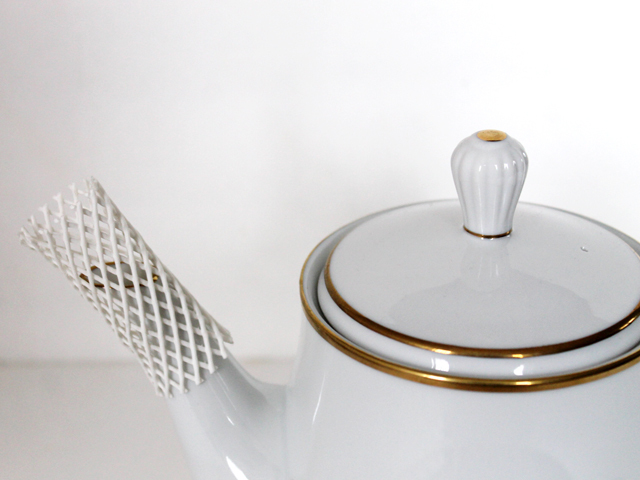 The truth with teapots seems to be that people either use them everyday, and so they get chipped and broken and thrown away, or they're the "good china" and therefore see little use, ultimately ending up at the thrift store in perfect condition. So, this time, I'm going to ignore the fact that this Bone China pot sells online for over $125 plus tax and shipping cost and just go ahead and use it .... carefully ... every day! 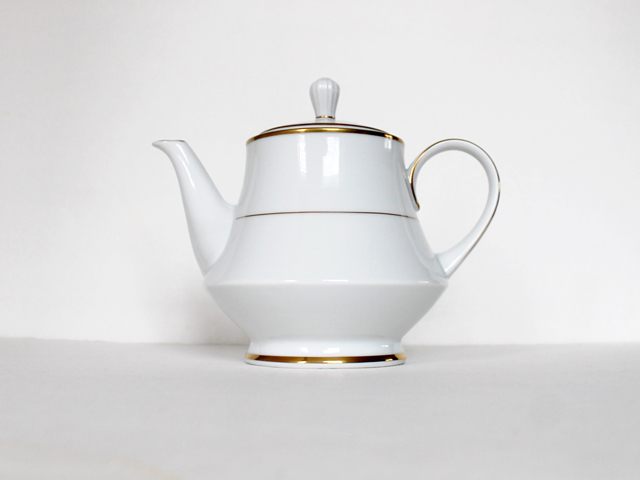 The make is "Noritake" and the pattern is "Heritage". Now, moving away from kitchen wares, I picked up a couple of pieces from the linens section - The first, not shown here, but you can see it on the dining table in this post of our Christmas/Birthday dinner with friends, was a brand new, never washed, huge cotton tablecloth, in a lovely turquoise colour, made by Cynthia Rowley. If you do look at those pictures, you might also spot the Penguin ice-bucket in use. 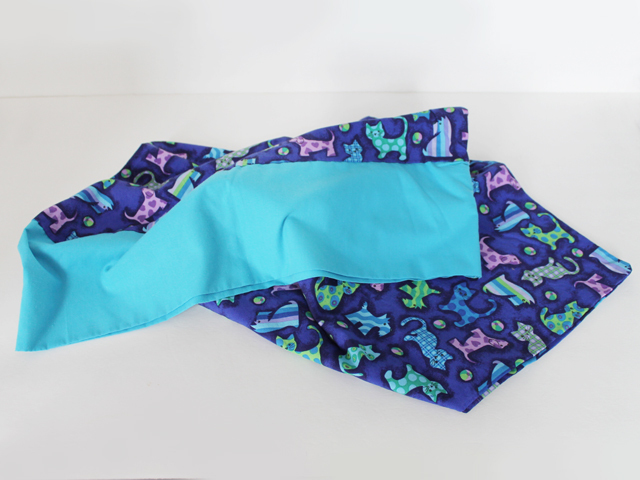 ↑ The other is this handmade pillow case, made from high quality, adorably printed, quilting cotton. I actually got it for the fabric, which appears to have been washed no more than a couple of times at most, and will probably be taking it apart to make something else. Or not -- I'm not sure yet. 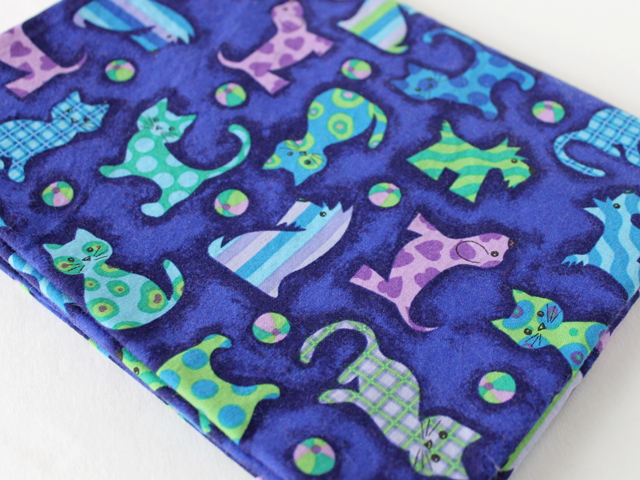 I know a certain feline who might like it to cover his mattress, which is actually just a regular bed pillow, popped into a clean litter-tray, somewhat like the set up seen in this post. 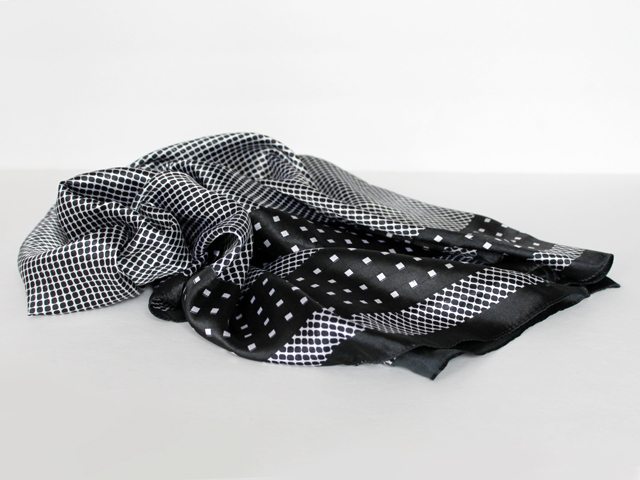 Finally, there is this silk scarf, that's in great condition and large enough to wrap around my neck and tie in the front. And that's it. Here's to making good use of other people's cast-offs! I always love to see your thrift shop finds, you photograph them so beautifully. 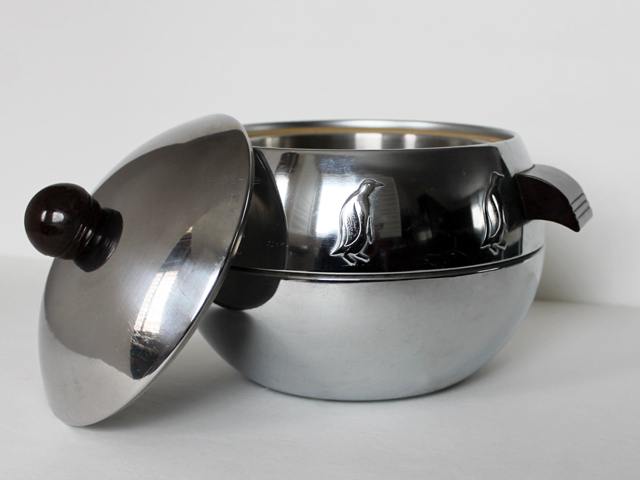 The penguin hot/cold pot is gorgeous, I love it. 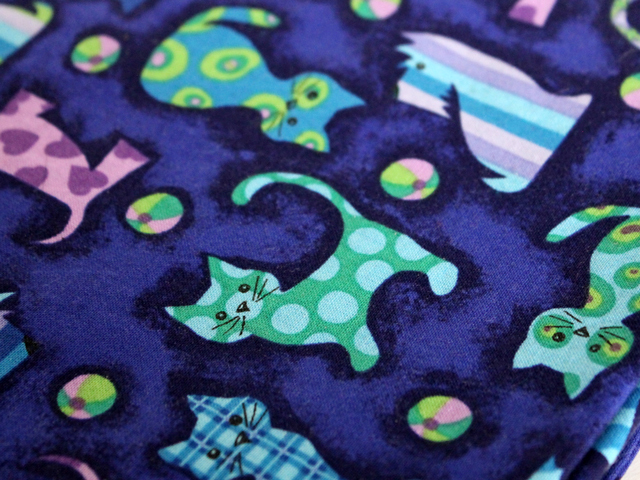 The cat pillow case is lovely, too. Thanks, Vix. That is funny that you had those same ashtrays! wow you have such an eye- you have impecable taste love all of your finds! oh wow, you had quite the amazing haul! Good for you for seeing the treasures tucked in those grab bags. 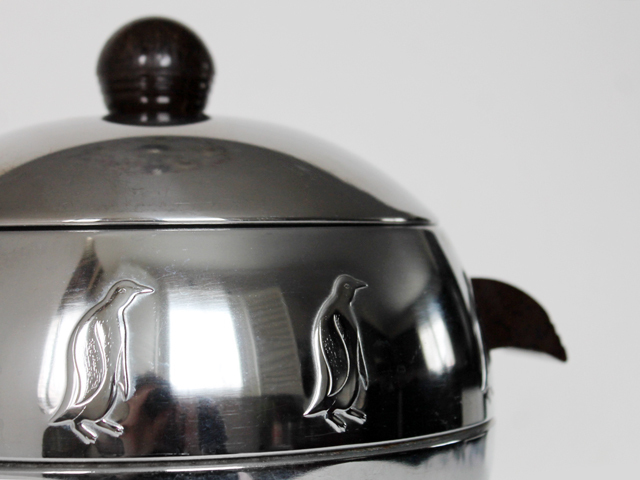 I’m in awe of that clever little penguin hot/cold server, it’s so charming! Hi Julie, you can find them on eBay certainly but if you find one at Goodwill or Value Village then there is no shipping cost and it’s infinitely cheaper!